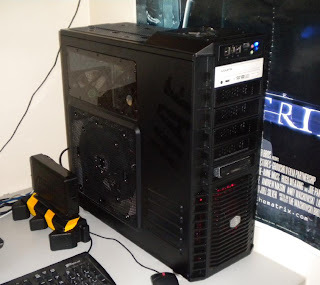 I realised recently that my new PC was just going to get too hot this summer, so I decided to go ahead and buy a new case with better cooling function. I bought a Cooler Master HAF 932 and amd very happy with it so far. 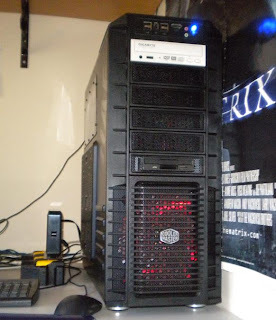 It totally dominates the office, but is quieter and cooler than the previous case. The previous case had three 120mm case fans, which while using the quiet Noctua fans, would still give off more noise than the fans in the HAF 932, because the new fans are much larger and spin more slowly. The HAF 932 has three 320mm fans and a 140mm fan at the back. Awesome cooling. Epic fail? Seriously, did you even read any reviews of your ATCS 840? "The Idle and CPU load result are both entrenched mid table, with the CPU load deltaT value a full 6°C hotter than the current champ, the Cooler Master HAF 932. " "The problem is that the ATCS 840 has become a victim of its size; the primary 230mm cooling fans are placed comparatively far away from the core hardware and so have limited effect in directing airflow off of or on to the sources of heat. "